In a bid to make our inside pollution days happy ones I decided to start a collection of arts and crafts tutorials, that can be done at home with the kids. All the art supplies will be sourced from online stores so parents don’t have to brave the pollution. I am a big fan of kids craft that both look cool and are usable. A crafty child is a happy child, and a happy child is a happy life. 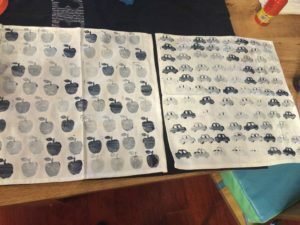 This time I wanted to do some textile stamping. I bought some cotton napkins here. 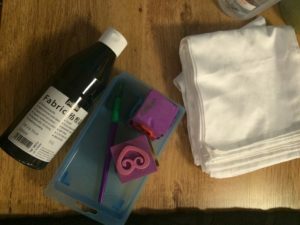 Napkins are woven tighter than kitchen towels, which makes napkins more suitable for textile stamping as the paint won’t blur. I choose a dark blue textile paint that matches the interior of my kitchen. 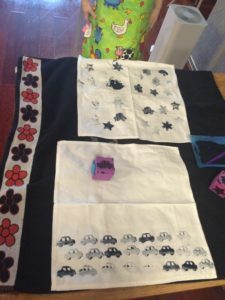 In this craft adventure I made use of an old kitchen towel to prevent paint from spilling onto our table. 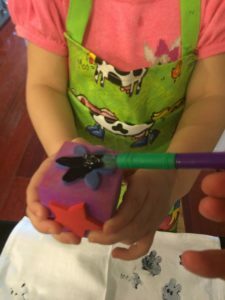 This craft is better for older kids as you don’t want the paint getting on their hands. My daughter is almost 4 and still rolls naked through paint. 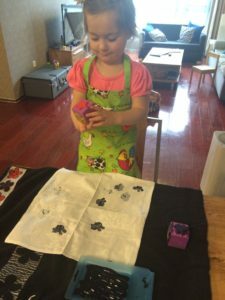 The art of textile stamping was a bit lost on her. I, however, found a new pastime and had a blast stamping the fabric. 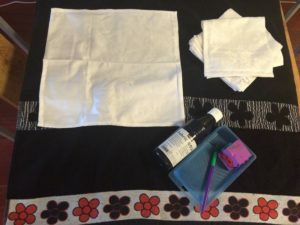 I found a great website explaining how to paint textiles. The website said that it is best to wash and iron the fabric first before applying the paint. However, since I was not as prepared as the woman from the website, we did not end up following either of the first two recommendations. Either way, I tend to live on the wild side of life and like to wing instructions and see what happens.